Did you know that how we think impacts on how we communicate with others? You know that each one of us is unique, so does it make sense that each of us thinks in our own unique way? 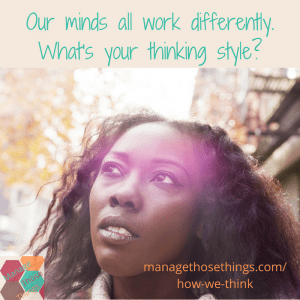 Each of us thinks in a different way, but how do others know how we think? Yes we communicate, but we generally communicate in the style to suit us, not our listener, so will what we say come across in the way we intend? Thinking, learning and communication are linked so closely aren’t they? Yet, do we really understand how we think and use that to our advantage in our business and personal lives? I had a wonderful conversation with Helyn Connerr who shared some insights into how we think differently from each other. She called it a “cognitive model” of thinking, learning and communicating. Her Mercury Model describes 12 different ways the mind thinks, we we all fit into. You may have yourself experienced difficulties at school, where you didn’t ‘learn’ in the same way as your peers. We all know of stories where children are “tossed out” or “written off” because they come across as disruptive in the classroom, but later turn out to have an entrepreneurial streak and are seen as a “success” later in life (we want talk about what success is here. I’ll keep that for another day!). What would you do differently in business if you understood your mind better? This isn’t about auditory, kinesthetic and visual learning styles. What we’re talking about here, is something much deeper. I’ve learnt myself that the Mercury Model is a quick and easy way to assess yourself and others, and then be able to use that understanding of how your mind ticks, to communicate in the right way with the other person. • The learning environment: including noise, temperature, familiarity, safety or colour. • The nature of the information itself: like traditional/innovative, significant or abstract. • The delivery: for instance repetition, fun, fast/slow pace, visuals or interaction. What tools do you currently use to develop your team? Do you consider mental dynamics? It’s not something I thought about before I was introduced to Helyn’s work. An example Helyn shared in our conversation of a team she worked with who had four similar minds working together and they couldn’t generate new ideas as they always looked at information in the same way. She thought the idea was amazing, but those 4 similar minds couldn’t make it work. To understand your own way of thinking, you will need to take a look at the books Helyn has written, as there’s too much to share in this space. I can assure you though, that understanding how we think will change your perspective in all areas of your life and business, so a little investment in money and time will reap rewards. Helyn suggested Fish Can’t Climb Trees for business owners. If you’re also a parent, you may also want to look at Learning without Tears (which was my first introduction to the Mercury Model). You can also work with Helyn one to one, or get her involved with your business or work team, if you’d like to understand how everyone thinks in a holistic way. Helyn will be sharing further insights in a Business Cheerleading Club workshop later this year. I’d love your thoughts on your understanding of how we think & how you currently manage this in your business. What have you learnt from my conversation with Helyn that you’d like to explore further? I always consider how my clients think when helping them to write books. Otherwise, the book will rarely get written. Thank you for sharing the Mercury Model – that was new to me. That’s why you’re such a great coach Dale! 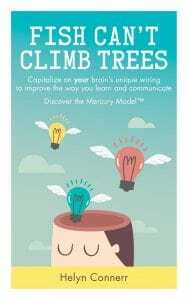 If you explore the Mercury Model further, I’d welcome your views on how it helps you develop what you currently do. Thanks. Not heard of the mercury model before, thanks for sharing that.